In the wake of the horrific injury sustained by Louisville’s Kevin Ware during the Elite Eight, the national conversation on college sports injuries has been reignited. Ware’s injury has made the inherent risks of college athletics front-page news. That injury, along with the continued discussions about the long-term effects of concussions, have highlighted the dangers of playing college sports. At Albion, this discussion is happening on a much smaller scale. 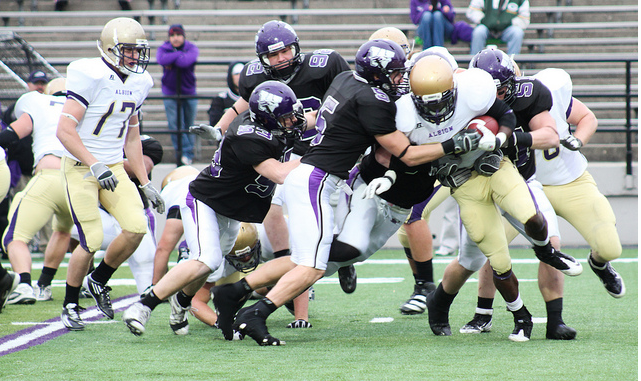 Division III athletics are very different from Division I. Albion cannot offer athletic scholarships, and on the surface it may seem that schools like ours simply do not have the resources to adequately care for severely-injured athletes. That is not the case. Albion provides full-service rehabilitative care to all injured athletes, as well as academic support. “We do everything from prevention of injuries to the initial evaluation, treatment, rehabilitation and eventual return to play,” said Sara Koski, head athletic trainer and clinical instructor. Koski has been on the sidelines of football games for eight years and has seen her fair share of injuries. When asked about Ware’s injury, she said that the injury itself is not always what trainers are most worried about. Koski is blunt about her reasoning. After the immediate response to the injury, athletes are entered into a full physical therapy program until they can return to the field of play. What many are concerned about is the academic cost of sports injuries, but student-athletes do not share those concerns. Hutton, a member of the Albion College men’s basketball team, was able to manage those costs through better organization. “I just had to be able to manage my time a lot better,” Hutton said. Koski was quick to point out the support that the school provides for student athletes. Other than academic support, student-athletes rely on their teammates during the tough recovery process. Both Koski and the players are clear on their advice to athletes trying to weigh the risk of injury with the desire to play Division III athletics. While Koski admits that there is a risk, she believes that for most sports the risk is minimal, and worth the potential rewards.